These resources help to introduce the topic, and recap upon previous learning. The movie introduces development looking at how different people and parts of the world experience different levels of development. Click on the tab in the bottom right.. These resources help to introduce the topic, and recap upon previous learning. 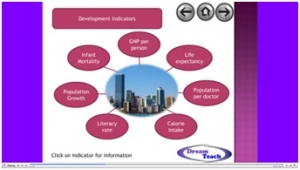 This presentation looks at the different ways in which we can measure development. These resources help to introduce the topic, and recap upon previous learning. 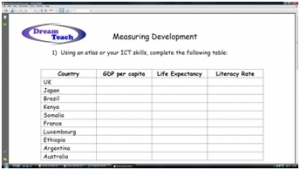 This measuring development worksheet allows possible ICT links, if access is available, although it can be completed with an atlas if ICT access is not.. These resources provide a fun way in which to simulate trade. Pupils are working in the dice manufacturing industry. They work in groups and are allotted different countries. The MEDCs have the tools to manufacture the dice, whilst the LEDCs have.. This is the net that is needed for the trade game. Ideally it needs to be printed or photocopied onto card, although paper will work ok. 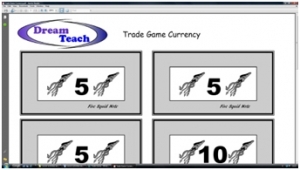 This is the currency that is used in the trade game. 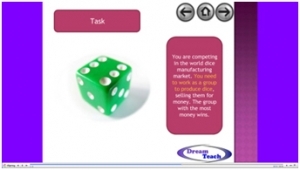 It is paid to pupil groups for completed dice. 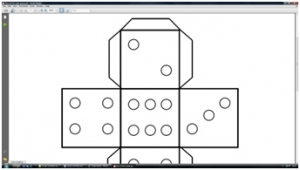 These instructions give a detailed guide as to how this game works, and how it can be an effective trade simulating tool in the classroom. 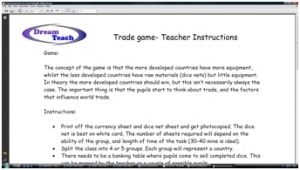 This worksheet allows pupils to reflect upon the game and how it might replicate trading in the real world. 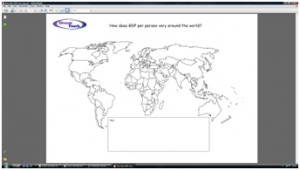 These tasks look at contrasting GDP per capita around the world. Pupils have to produce a choropleth map and work through a variety of other tasks. This is the map for pupils to use. These tasks look at contrasting GDP per capita around the world. Pupils have to produce a choropleth map and work through a variety of other tasks. This is the standard worksheet where GDP figures are already provided for pupils. 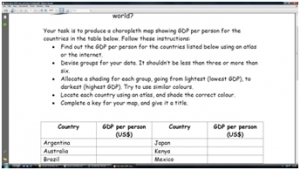 This is a harder verison of the worksheet where pupils need to find GDP data for themselves, using their ICT or atlas skills. 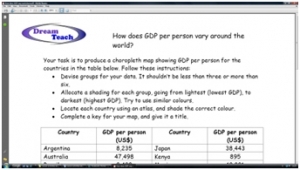 This choropleth mapping presentation will help pupils with this skill, as it is required to complete the GDP map. 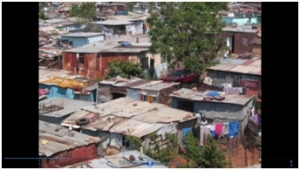 These resources look at some common myths surrounding development. This contrasting development presentation asks pupils to look at a range of images, with a very interesting conclusion at the end. These resources look at some common myths surrounding development. 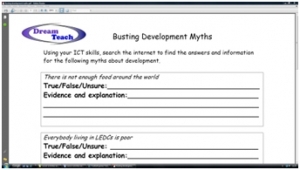 This busting development myths worksheet requires ICT access, as pupils research a range of development myths. 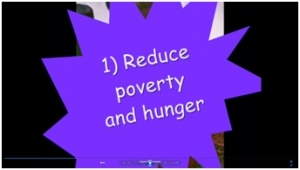 This movie introduces the Millennium development goals, and provides a stimulus for further work on the subject. Click on the tab in the bottom right corner to enlarge.